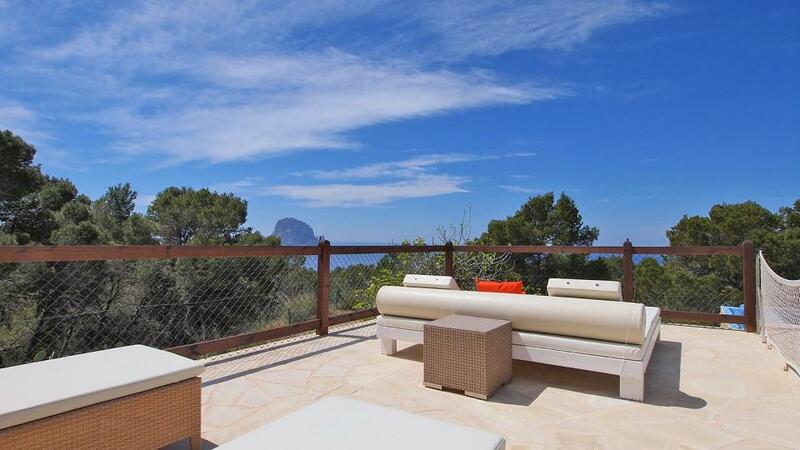 Completely renovated villa of 200 m2, modern style, located on a plot of 2650 m2, with an exceptional view of the beach of Cala Vadella and the islands Bledas and S'Espartar. 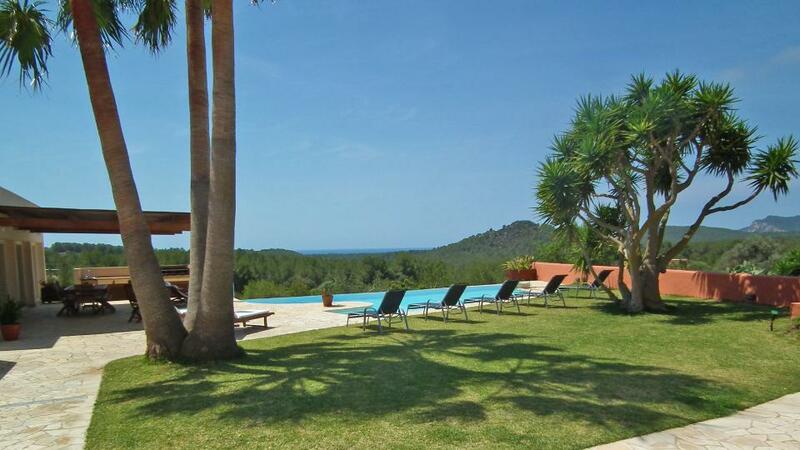 This villa is composed of 5 bedrooms and 4 bathrooms. The fifth bedroom, on the other hand, is a bedroom more suited to a baby sitter or house staff; the latter does not benefit from the same benefits as the others. This house is ideal for a large family. Room, Ground level. This bedroom has 2 twin beds. Bathroom outside the room, With shower. This bedroom includes also air conditioning. Room, Ground level. This bedroom has 1 double bed. Bathroom outside the room, shared, With shower. This bedroom includes also air conditioning. Room, Ground level, direct access to the pool, direct access to the terrace. This bedroom has 1 double bed. Bathroom outside the room, shared, With shower. This bedroom includes also TV. Room, Ground level. This bedroom has 1 double bed. Bathroom ensuite, With shower. This bedroom includes also air conditioning. Guest bedroom, Ground level. This bedroom has 1 single bed. Bathroom outside the room, With shower. Entrance by a small staircase whose extension gives directly on the beach. Large living room, dining room with plasma TV, air conditioning, all open on the huge outdoor terrace. 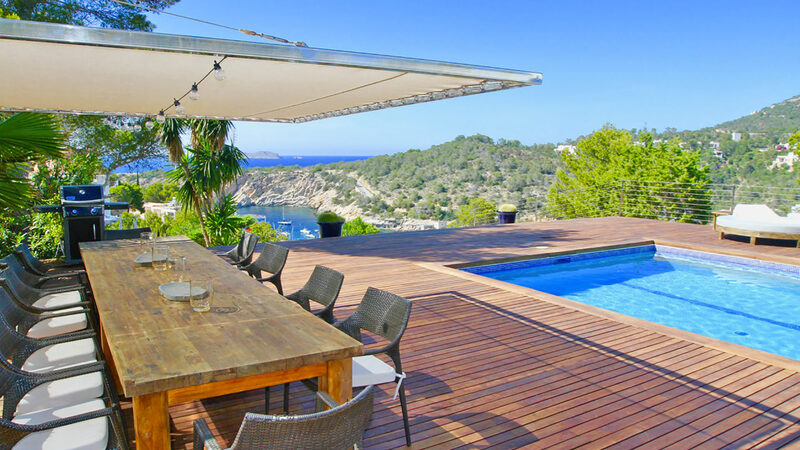 Superb teak terrace with relaxation area. Pool of 12 x 5 m.
Outdoor dining room for 12 people. Other dining room for 4 people and viewpoint. The entrance to the house is about 20 meters from the road with stairs. No private parking. The property is approximately 800 m away, where you will also find restaurants, bars and a small supermarket. The most beautiful beaches of the island, within a radius of 10 km. 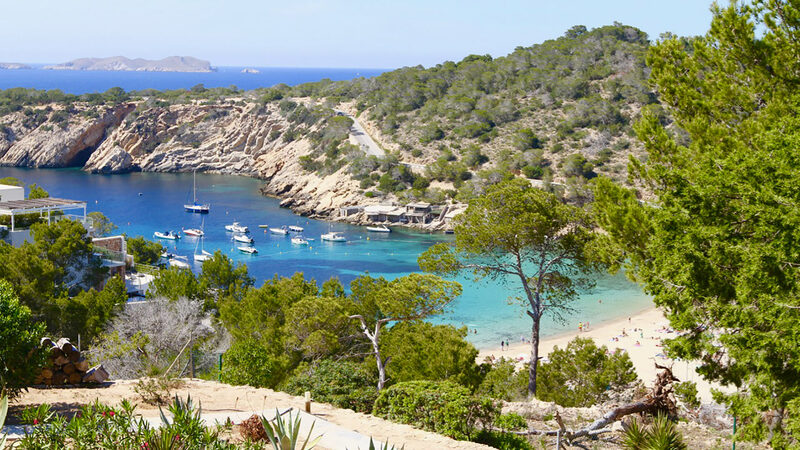 Ibiza town is less than 25 minutes by car.